POSTED February 14, 2018 2:48 p.m. Number nine-ranked UW–Platteville defeated No. 18 UW–Stevens Point Wednesday night on Bo Ryan Court, 56–47 in a WIAC battle for first place. A typically strong-starting Pioneers (18–3, 9–2) team jumped out to an 8–0 lead and held the Pointers scoreless until nearly six minutes into the first half when UW–Stevens Point (15–6, 9–2) got on the board with a Brett Tauber three. UW–Platteville didn’t give up another basket for three minutes, but was also shutout for close to six minutes themselves in the middle of the first half. Junior Clay Gerds ended the scoreless streak with a layup, but the Pointers followed with a 7–0 run to put themselves up 16–12 with 8:33 left. UW–Platteville responded with their own 7–0 run, and a tough Pioneers defense gave up just two points the rest of the half. With a ferocious block by Gerds as time expired, the Pioneers entered the locker room up 21–18. The first half scores were the lowest scoring halves either team has put together all season. Quiet in the first 20 minutes, back-to-back layups by junior Robert Duax put UW–Platteville up 29–22 and forced UW–Stevens Point into a timeout. A basket by the Pointers’ Canon O’Heron cut the lead to five, but a Carter Voelker three gave the Pioneers an eight point lead on the next possession. 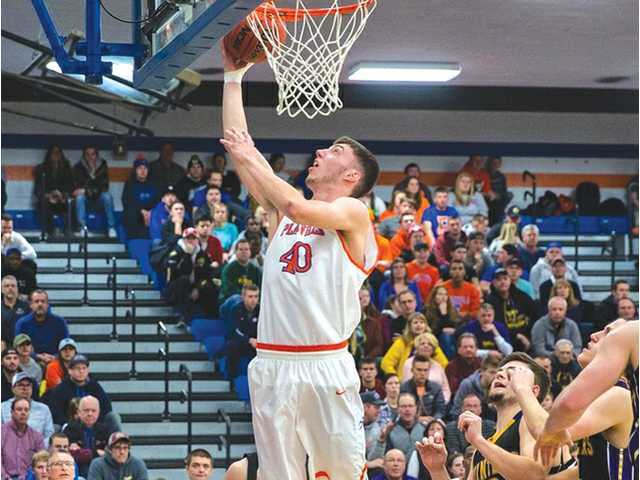 After UW–Platteville stretched out their lead to eight two more times, UW–Stevens Point showed why they are one of the top teams in the country. Over a nine minute span, the Pointers held the Pioneers to just eight points, and with 3:42 remaining tied the game at 44–44 on a Brandon Spray jumper. Following Spray’s jumper, freshman Quentin Shields immediately pulled up just inside the three-point line and knocked down the shot to put the Pioneers back on top. Two possessions later Shields put in a backdoor layup on a pass from Voelker to go up four. After stopping UWSP on the ensuing possession, Duax scored on a put back with 43 seconds remaining for a 50–44 lead. A Point missed three was rebounded by the Pioneers, and Shields knocked down six-of-six free throws to secure the win. Shields scored a career high 21 points and came a rebound shy of a double–double. Duax was the only other Pioneer to score in double digits with 10. Senior Jake Showalter grabbed a season high 9 rebounds. O’Heron led UW-Stevens Point with 14 points followed by Spray with nine. With the win, UW–Platteville tied UW–Stevens Point for the top spot in the WIAC with just three games remaining on the conference schedule. EAU CLAIRE UW–Platteville shot a blistering 61.3 percent from the floor, including 73 percent after halftime, in an 87–50 win over the Blugolds at Zorn Arena on Saturday night. The ninth-ranked Pioneers used a 14-0 run after the first media timeout, and UW-Eau Claire never got closer than eight points away the rest of the night. Senior Matt Oestreich had it going early and often, shooting a perfect 7-for-7 from the floor to finish with a game-high 18 points. Junior Robert Duax played both scorer and distributer, adding 16 while dishing out five assists. The Blugolds had no answer for either Clay Gerds down low (14 points, 10 rebounds) or Quentin Shields’ quickness off the bench (14 points) in a balanced effort. The Pioneers improved to 20–3, 10–2, and stayed pace with UW–Stevens Point on top of the WIAC. UW–Platteville hosts UW–Whitewater (16–7, 6–6 WIAC) on Wednesday and UW–River Falls (15–7, 6–6) on Saturday in what are two of the bigger home games in recent memory. It’s that way because they took care of business on the road Saturday. UW–Stevens Point (15–7, 9–2) — MJ Delmore 3, Nate Dodge 7, Drew Drederickson 5, Canon O’Heron 14, Brett Tauber 3, Brandon Spray 9, Mark Nelson 6. Totals — 20-58 3-4 57. UW–Platteville (19–3, 9–2) — Jake Showalter 7, Matt Oestreich 5, Carter Voelker 7, Clay Gerds 6, Quentin Shields 21, Robert Duax 10. Totals — 33-52 8-11 56. 3-point goals — SP: 4 (Delmore 1, Dodge 1, Tauber 1, Spray 1); P: 2 (Voleker 1, Shields 1). Team fouls — SP: 17; P: 10. Fouled out — SP: Delmore. UW–Platteville (20–3, 10–2) — Jake Showalter 2, Matt Oestreich 18, Robert Duax 16, Carter Voelker 2, Clay Gerds 14, Alex Ranney 5, Quentin Shields 14, Trey Sigel 9, Tanner Hudziak 3, Justin Stovall 2, Dan Lowe 3. Totals — 34-55 8-11 87. UW–Eau Claire (11–12, 3–9) — Chris Duff 15, George Diekelman 6, Cole Rabedeaux 2, Dan Becken 11, Steve Christiansen 2, Blake Wacholz 3, Ben Widdes 3, Montrell Oliver 5, Adam Link 3 Totals — 26-60 8-11 67. 3-point goals — P: 10 (Oestreich 2, Duax 1, Ranney 1, Shields 2, Sigel 3, Hudziak 1), EC: 8 (Duff 3, Diekelman 1, Becken 2, Wacholz 1, Widdes 1). Team fouls — P: 8; EC: 14. Fouled out — none.